Five years. Wow. Five years in a row, two as a Municipal Liaison (though I was so busy this November I hardly did anything) and five completed novels. People keep asking me if I will post them. The answer is an unqualified no. What I write is not even first draft. It’s rough sketch at best. As such, it’s also highly embarrassing. I don’t want to share that stuff with people. This year, I plan on focusing my efforts and either pulling one of the five into better shape or doing something new but not in sketch mode but actual author mode. I promise select friends will be asked to proof that and give me constructive feedback and, later, everyone else will get a shot at reading it. Whatever it ends up being. I spent this year doing a lot of self-analysis and figuring out where I was weak as a writer and what I needed to work on. I now have a list of areas I want to target and am going to be looking at resources to help me (classes, books, whatever). I want to make 2012 the year I get my act together, hone my ability as a writer, and go from playing around with words to working with them instead. In short, me want write good. 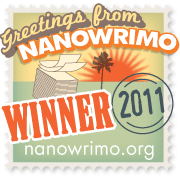 But for the moment, I’ll just bask in the glow of five straight years as a NaNo winner. I’ll get to work tomorrow. I went dark again this November doing the National Novel Writing Month. This is an annual competition to write a 50,000 word novel in 30 days. The idea is pure creativity. No editing, no thinking, just write and don’t stop. I just finished (hours earlier than I finished last year despite the fact that I got a late start this year). My story this year is a time travel story (which is a real challenge when you are trying to write straight through — time travel requires a lot of planning and watching for inconsistencies and the like) which is also a love story (I’m a sap, what can I say?) I’m actually very happy with it and, unlike last year’s novel, I plan on coming back to it and editing it and tightening it all up. But not today. Today, I just want to kick back and relax. I did it. I wrote my second novel and just want to bask in the glow of that achievement.